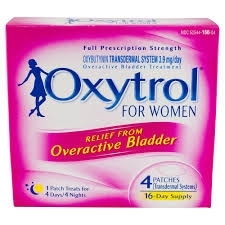 Each Oxytrol® For Women patch delivers 3.9mg of oxybutynin per day for a continuous four days and nights. By helping to relax the bladder muscle, Oxytrol® For Women helps reduce symptoms of overactive bladder: Urinary Urgency, Urinary Frequency, Urge Incontinence. Open one pouch and apply immediately (see step 2). Do not use if pouch is torn or opened. Apply patch immediately to a clean, dry and smooth area of the skin on your abdomen, hips or buttocks. Do not put the patch on oily, damaged (cut or scraped), or irritated (rashes) skin. Do not put the patch on skin with oils, lotions or powders because that could keep the patch from sticking to your skin. Wear the patch under clothing. Do not expose the patch to sunlight. Do not cut the patch into smaller pieces. Wear only one patch at a time for four days in a row. After four days, remove the used patch and apply a new one. Each time you put on a new patch, change the place where you put it (i.e. abdomen, hips or buttocks). If a patch falls off and you cannot press it back onto your skin, use a new patch. Apply the new patch in a different area of skin on your abdomen, hips or buttocks. When you take off the used patch, fold it in half with the sticky sides together and throw it away so that it cannot be worn or swallowed by another person, especially a child, or a pet. ACTIVE Oxybutynin 3.9 mg/day INACTIVE Acrylic adhesive, polyester/ethylene-vinyl acetate film, siliconized polyester film, and triacetin.